Saad El-Katatni, former secretary-general of the Muslim Brotherhood's Freedom and Justice Party (FJP), won elections on Friday for chairmanship of the party. 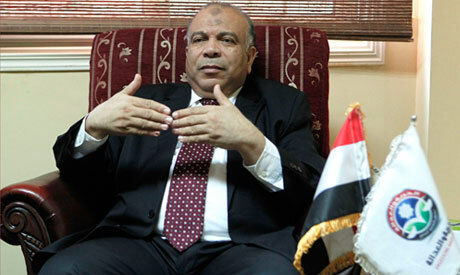 El-Katatni had served as speaker for the now-dissolved lower house of Egypt's first post-Mubarak parliament. On Friday afternoon, Hussein Ibrahim, head of the party's electoral commission, announced El-Katatni as the winner with 581 out of 864 votes. El-Katatni, 60, is a microbiologist by profession who worked as a professor at Minya University's science faculty from 1994 to 1998. He joined the Brotherhood in 1981 and was elected to the group's prestigious Guidance Bureau in 2008. He first gained public notice when he was elected parliamentary speaker in Egypt's first post-revolution parliament late last year. He has historically leaned towards the Brotherhood's more conservative current. El-Katatni, whose electoral slogan was "a strong party to build Egypt," beat out acting FJP chairman Essam El-Erian for the position. The FJP is the political arm of Egypt's Muslim Brotherhood, the largest political group in the post-Mubarak era. The party was established in May of last year, shortly after the Tahrir Square uprising that led to Mubarak's ouster. The FJP's first president was Mohamed Morsi, who resigned from the post after being elected president of Egypt in June. "The party's internal elections reflect the development of democracy in Egypt," the FJP's Ibrahim said shortly before polling began. According to party bylaws, only the FJP General Assembly's 1,117 members are allowed to cast ballots for party president. The FJP currently boasts a total of over 400,000 members. The Brotherhood had toyed with the notion of forming a political party a few years ago, but never did. Many leading Brotherhood figures, including current Supreme Guide Mohamed Badie, opposed the idea, arguing that it would hinder the group's charity work and preaching activities. But in the wake of last year's revolution, the group went ahead with its plans to establish the party. Morsi was appointed the party's first president, while other Brotherhood members were given key party positions. The party's just-concluded internal elections, therefore, mark the first time for FJP members to cast votes for the party chairman.